We think Christians should be the most generous people (2 Corinthians 9:6) on earth to support worthy causes, and there is no organization with more potential to change the world than the local church (Ephesians 3:10)! 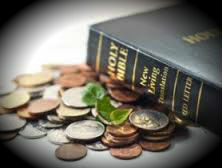 The Bible is clear that stewardship includes more than just money. How we use our time, our gifts and abilities, and all of our resources are important to God.